AS IT STANDS: Do Not Disturb: It's Time For Football In America With These 6 House Rules! Do Not Disturb: It's Time For Football In America With These 6 House Rules! 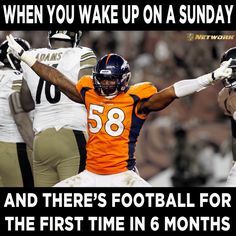 Despite the fact that the NFL season started with a Thursday Night Football match up between Denver and North Carolina, the real season starts today. So don't be calling me, or texting me today. If you stop by the house you better be ready to watch some grown men smash into each other like billy goats! Because the Rams came back to LA, I'm picking them as a team to follow. As an original Ram fan, before they left for the wilds of St. Louis, this seems like poetic justice or karma. 1) Do not disturb me for anything that is not football related. 2) The food for the day shall be tacos and pizza. 3) Beer is the preferred drink of the day - scotch or bourbon are also acceptable. 4) Official Snacks consist of: Hot Buffalo Wings, Cheetos, slices of lunch meat and cheese spread out in a football shaped tray, and an eclectic assortment of pot brownies, cookies, and gummy bears. 5) Fantasy football is spoken freely and often throughout the day. 6) The TV will be put on hold whenever I have to go to the bathroom. No exceptions. May your fantasy team win big!